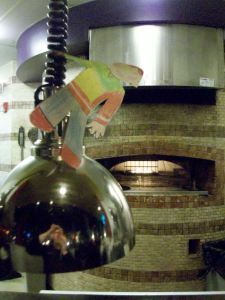 The other day Flat Stanley came along with me to work at Brixx Wood Fired Pizza in Charlotte. You can see Flat Stanley helped to cook the pizzas. First, he helped to look in on the pizzas while they cook in the large brick oven. You can see the wood and gas flames we use to cook our pizzas. While the pizzas were cooking, Flat Stanley decided to hang out in the window and play with some of our dishes. Pizzas are out and they look yummy!!! Thanks Flat Stanley. Due to the snow we recently got, Jake and Flat Stanley couldn’t go to school. We had a good time making a snowman. Flat Stanley was worried about getting too wet so he couldn’t help too much. However he did enjoy posing with pictures of the finished product. « Flat Stanley Visits the Missouri State Capitol!